It's no surprise that the policies for both the Xbox One and the PlayStation 4 have been set. Pre-orders are now available for both consoles and gamers can finally vote with their wallets for the console that suits their taste. Well, gamers aren't the only ones voting with their wallets, investors are playing a bit of shuffle with the stock of both Sony and Microsoft. While gaming isn't the largest part of either mega-corporation's portfolio, it was obviously enough of an attention grabber to cause stocks to shift during the trading day, according to a report from GameIndustry.biz. As of the time of GI's article being published, Sony's stock climbed 1.7 percent and Microsoft's stock dipped nearly 1.7 percent. What a trade-off, eh? As of the publishing of this article, however, Microsoft's stock has slightly recovered, only 1.34 percent down on trading, where-as Sony has stabilized at 1.44 percent above their standard. The initial E3 conferences obviously surged the stock options for both companies a bit during yesterday's big unveiling for the PS4 and the Xbox One. If you don't know why the stock options are the way they are, just take note that the Xbox One has solidified its stance with the DRM policies and Sony came out on stage shooting down DRM and throwing precise strikes to down their opponent the way Alistar Overeem completely dominated and ended the career of Brock Lesnar in the UFC. No prisoners taken. The DRM wasn't the only thing that had gamers excited about Sony and the PlayStation 4...the sleek as a Ferrarri's body price-point of $399.99 garnered massive attention and the 140 games the system has planned to release within the first year set fanboys on fire with fervor unforeseen in the gaming community. 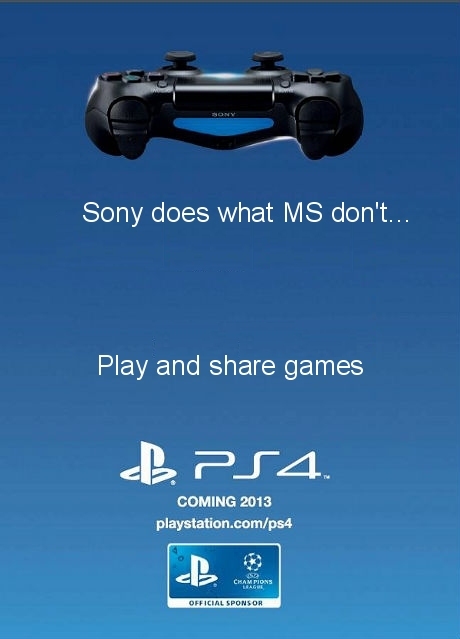 The ultra combo Sony laid out on Microsoft was followed up with a fatality and a flawless victory. It basically looked like the image below. Don't be surprised if we see more stock shifting based on both company's gaming divisions this fall, when the Xbox One and PS4 go head-to-head for second place behind the Wii U.